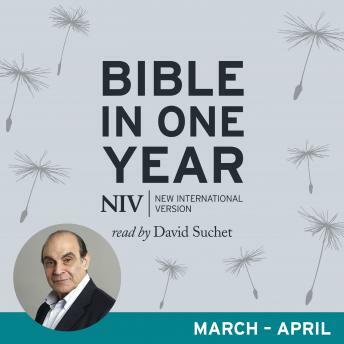 Listen through the Bible in one year read by David Suchet. This download contains the readings for March and April. Acclaimed British actor David Suchet, best known for his TV portrayal of Agatha Christie's Poirot, reads the New International Version - the world's most popular translation in modern English. This audio digital download includes the readings for March and April. In March and April you will cover Mark 10 to John 1 from the New Testament, and Leviticus 5-27, Numbers, Deuteronomy and Joshua 1-18 from the Old Testament, as well as a selection from Psalms and Proverbs each day.